Echo Park Paper's Here & Now collection & some giveaways! Here and Now is a new collection from Echo Park Paper. It's full of bright colors, word bubbles, chalkboard and trendy elements. The collection consists of twelve 12x12 inch sheets of double-sided paper, one 12 x 12 Element sticker and one 12 x 12 Alpha sticker (it has two alphas and more element stickers). The stickers playful with every-day memories themes. There's lots of graphic and trendy elements - feathers, arrows, banners etc. It also includes a nod to Project Life with a sheet each of 4x6 and 3x4 journaling cards. The color palette was bring and fun, I'm drawn to bright colors, maybe because I have a tween in the house, but it felt perfect for her! Awesome b-sides, if I didn't like one side then I definitely liked the other - good graphic, tone-on-tone patterns that can be used for any kind of layout. I really liked the slight distressing - I used to find Echo Park products a little too clean for my taste - the tiny bit of distressing really makes a big difference. It's hard to complain about this one - if I didn't like one side of paper, I did like the other. There's lot of variety of patters. Two different alphas are included (one small and one not-so-small) - I could maybe have done with a slightly bigger alpha. Maybe. I used the "Project Life" journaling cards on another card and added some dimension with stickers and foam adhesive. 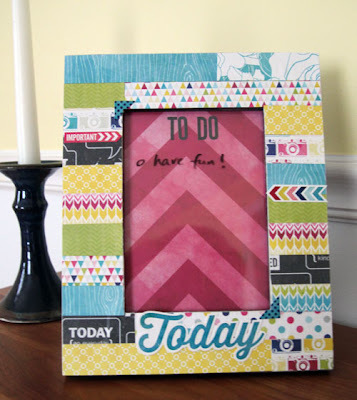 I decorated a frame with strips of patterned paper to create a patchwork effect. I framed some patterned paper and added the TO DO stickers. The result: a fun desk-sized dry erase board! Suppliers: Echo Park papers and stickers, wooden frame. Are you drawn to this color scheme. Could you see yourself using these papers and elements? 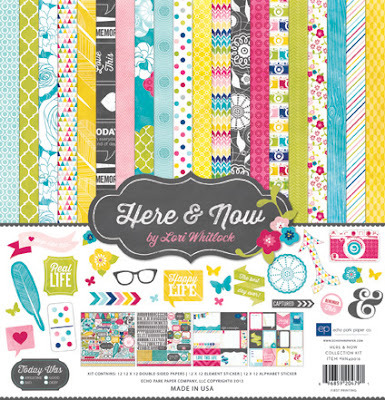 Leave a comment here by midnight EST on Wednesday to be entered to win a fab Echo Park Paper Here & Now kit! US residents only and please leave a way to be contacted! I totally agree with you.One of the things I really love about Echo Park is their "B" side papers.I can always use everything in a collection. I'm a fan of Echo Park as well. Looks like a great summery line. Great projects!! Such cute cards & love the frame! 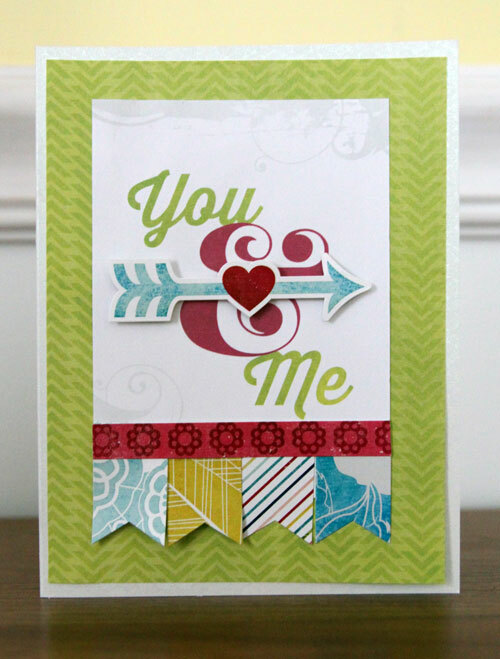 I love the line...bright & cheery and wonderful color palette. Thumbs up for me! 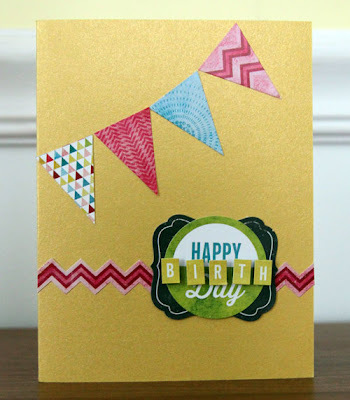 You can't go wrong with Echo Park paper by Lori. Thanks for the chance to win it. Echo Park has done it again! I am in love with nearly all of their lines. I really think this is a fun line for boys and girls, all ages! I like the colors, especially the limey one. I can see me using these for summery projects. They look great. I like the sunglasses, etc., too. I love the colors, as they give so much versatility--I am alreayd thinking of many ways to use this! Love everything from EP. Their lines make it easy to complete a layout or even an album with minimal effort. Love the dry erase board! Looks like a fun collection! I always love Echo Park's products - but I have to say that I especially LOVE this one! LOVE how the patterns and colors match so perfectly together!!! I love the variety and color combination in this collection. fI have liked everything I have ever gotten from Echo Park. I especially like their use of pink and turquoise together. And I also agree with you that if you don't like one side of their paper, you will like the other side. The colors drew me in, too. I'm glad you did some projects with it so I can "see it in action". I definitely want this kit! Echo Park always puts out great collections! Love the camera and chevron patterns, plus chalkboard images here. And yes, bright colors draw me in too. Neon is especially popular with my kids' clothing choices lately, so I can totally see myself crafting with this fun line. Echo Park does a really good job of having very usable products! Love this EP collection too! I love the fresh color palette. Great for summer fun! I like the color palette for the summer months. It looks very trendy with all the little icons. Echo Park has always been at the top of my favorite paper companies!! I love the color scheme. I have girls and am a sucker for anything that has pink in it. I see cameras! I'm a sucker for anything photography related. I like how colorful this collection is! The colors are great, especially the butter yellow. I would definitely use these--I like to use the paper as a jumping off point, and these are really great. I'd like to make a mini album with them. Thanks for the review. I really enjoyed seeing your projects. I have many pictures to scrap of my grad and many would be perfect for this line.